Project Alicia : Not So Wordless Wednesday: BRRRRRR!! Not So Wordless Wednesday: BRRRRRR!! Oh, what do you do in the wintertime when all the world is white? Ok, so it's not exactly white here yet, just really, REALLY cold. AccuWeather said "feels like 12" but when that wind picked up it felt like single digits to me. Yes, I'm whining. And wishing I was a bird so I could migrate south til spring. My son concurred after his brisk walk home from the bus stop. I tried to tell him... but it's not cool for 11 year old boys to listen to their mothers or wear coats. I get it. Problem is I am not a bear. Or a lover of freezing temps. I don't have that extra layer of blubber or hair to insulate me. You can mock me if you must, but this really is a flaw come wintertime in Iowa when you are only double digits in terms of weight. And it is only the beginning. I know we've been gifted with warmer than usual temps up until now, but I can't help but dread the colder temps ahead. My kids have already started name calling the shivering noises that exit my mouth. So, I did the only thing I could think of to cheer me up. I trolled my old pics. Pics of cold, white, perfectly preserved days last winter. I guess if it's going to be this cold it might as well snow so we can play. We certainly know how to do that. And boy did we have some fun white, winter excursions. So, I'm digging out my thermals and long wool socks, hats and scarves, and anything warm. I'm gonna have a rockin fun time this winter, freezing temps and all. I deserve nothing less. Oh, and by the way, I'm a hoarder of "shut in, too cold to go outside snow day" kind of ideas. In case you missed my Doughnut Snowmen, here's a card for the taking. A great way to pass some time. And yummy to boot. Just right click and save as an image and print. Voila. And check out this fun idea for days above 10 degrees. Ever spray paint snow with kool-aid? Now why didn't I think of that? Got any fab winter ideas for kids? By all means, please share. You can also find a complete list of WW hosts over at Shibley Smiles. Let the games begin. Not to gloat but we were wearing short-sleeves here yesterday and still sweating! Although, really my kids would love to have some snow to play in! I'm not ready for it to be cold OR white. Pooh. I guess I just need to think of the pictures I can get! Brrrrr is right! I'd rather be cold than hot any day, but this almost looks too cold... even more me. Gorgeous photos, as always!! Yikes! I thought that you had already gotten a huge snow storm until I read your post. Phew! Well regardless...stay warm! It's gotten COLD here too! Those doughnut snowmen look great. I may have to make them for preschool next week. Will you adopt me? I'd love to be one of your kids. :) Does the fun ever end in the land of Rasmussens? lol Great photos, Lish. Happy WW! Wintertime??? What's that? Its summer year round here. No snow for us. Great pictures, looks like fun!! Brrr! That snowman is cute! May have to try it. Don't know why but linky's not taking me tonight. We had record breaking cold spell that past week or so. I never quite believe it when it begins getting cold. We don't have the extremes that you have, still it's seems so odd to have it so hot then so cold just a few months later, here on the coast it could even be hot one day and freezing the next. Seriously... you guys have too much fun.. I wanna come one some adventures with you guys. Looks like a good time! AND those doughnut snowmen look amazing!!! and here we are, on the other side of the world, enjoying an early summer and coming up to our longest day - wanna join me!?!?!?!! New follower - found you through wordless wednesday - great blog! It went and turned cold in GA, too! Love those snowmen. Too cute! Happy WW! Thanks for the linky! I hate the cold too! Not sure how I managed 5 years in Michigan :). 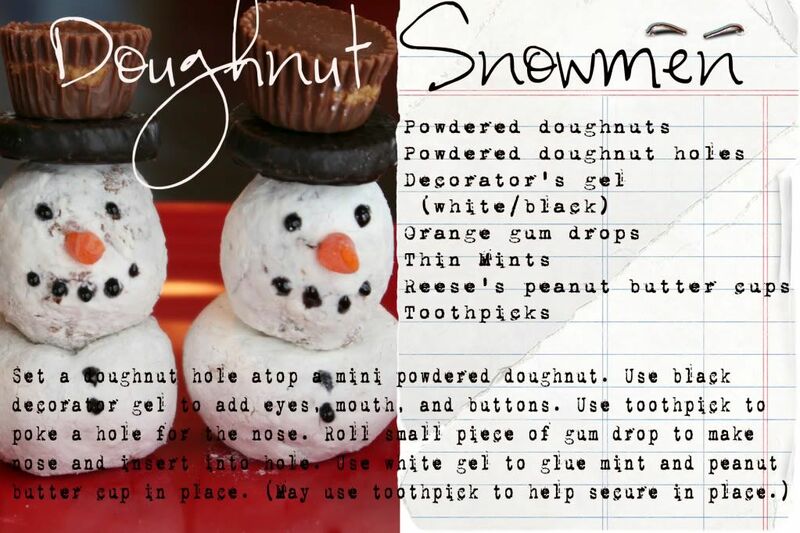 Thanks for sharing that donut snowmen recipe!! Looks like tons of fun! Brrrr!!!! I hate the cold! But the pics are soooo beautiful. Looks like a fun time in the snow. I love all the cold photos! I'm not a fan of the cold, but this year I think it might be my friend since I have plenty of extra layers to cool off!! Usually... hater of the cold!!! P.S. I'm not usually superstitious either, but you need another follower and fast! Super cute doughnut snowmen! We're going to make those. Thanks! There is NO WAY to truly prepare for the cold of winter. Although I think my body is trying because I think I've got about 4-5 lbs of new blubber since Thanksgiving. That slideshow is fantastic - what'd you use to put it together? I'm looking for an easy way to share Alex's year in photos with his grandparents. See, that is EXACTLY why I live in sunny Florida. Sure, I miss the snow and so we plan winter trips to play and get our fill. But after about a week of it, I miss my flip flops. I can't handle cold weather. What great pictures! You have a beautiful family! I also have to say, those snowman are adorable! I am going to try making them. Thanks for sharing such a fun idea! Those pictures are great! I don't do well with the cold either LOL. Although I do love skiing, and sledding and playing in the snow. I am total contradiction LOL! Hope you have a wonderful day today! I'll take cold over snow anyday! I'm sitting here complaining about 50 degree weather here in So Cal, burrrrr. It sure looks pretty though. I always enjoy your blog... The snowmen are a great edible craft - I think I know how to keep the 3 year old occupied this weekend! We just finished making 'Reindeer Food' with oats and sparkles in prep for the Big Guy coming. And, just so you feel better, its freakin' cold over here too. Glad we bought that snow blower now! I'm with you - cold cold go away! I don't like it under 50 let alone single digits - BRRRR! With 9 children it sometimes gets tough not feel house bound - so we go to a bouncy place or a museum and just have a blast! Arts and crafts are awesome this time of year too. I usually put them away for a while and bring them out in Jan - March. They love it! Fun shots of your winter time fun! Snow is over 5hrs away , in our winter June/July /August. Even futher away at the farm - we have torrential rain here at the moment no snow ever.